I am of a certain generation that cannot think of chicken pot pie without thinking of Cartman from South Park. I didn’t even really like that show but yet the most popular lines from the show were basically everywhere for several years. Good grief, I feel sorry for anyone named Kenny during that time. In the end, I have to say, I am on Cartman’s side when it comes to pot pie–don’t touch my chicken pot pie. This isn’t a dish I make often because it does require quite a bit of prep and a lot of steps but the elements can be made ahead and assembled just before baking if you want a faster weeknight meal. Its also a great way to use up leftover chicken. I always roast two chickens when I’m making one for dinner–it doesn’t require any more time really and then you have cooked chicken ready for a dish like this (or soup!). 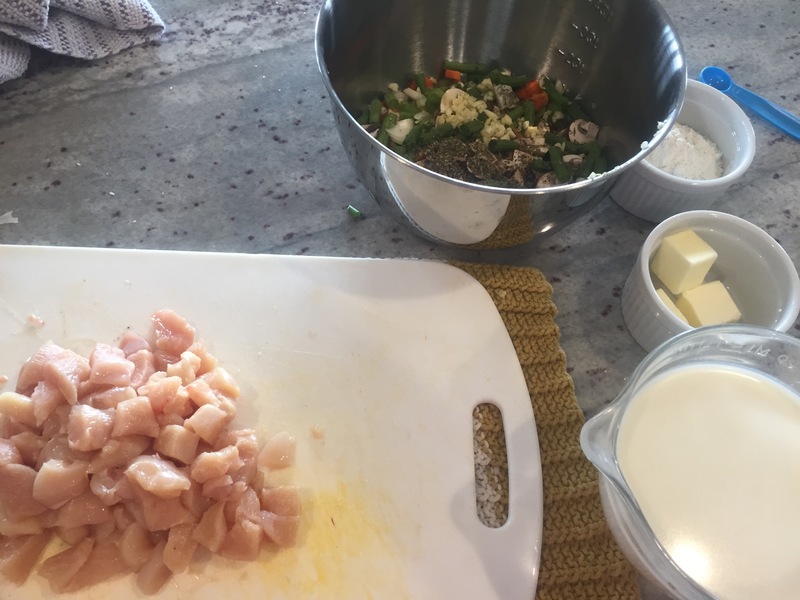 The key to making a quick (relatively, anyway) chicken pot pie is all in the mise en place. Get everything out and ready to go so you can work quickly. You don’t want your vegetables overcooking while you are trying to get the milk out of the fridge and measured. That way lies madness–so get everything chopped, measured, and ready to go before you turn on the burner. If you aren’t using leftover chicken, you’ll need to cook yours up. 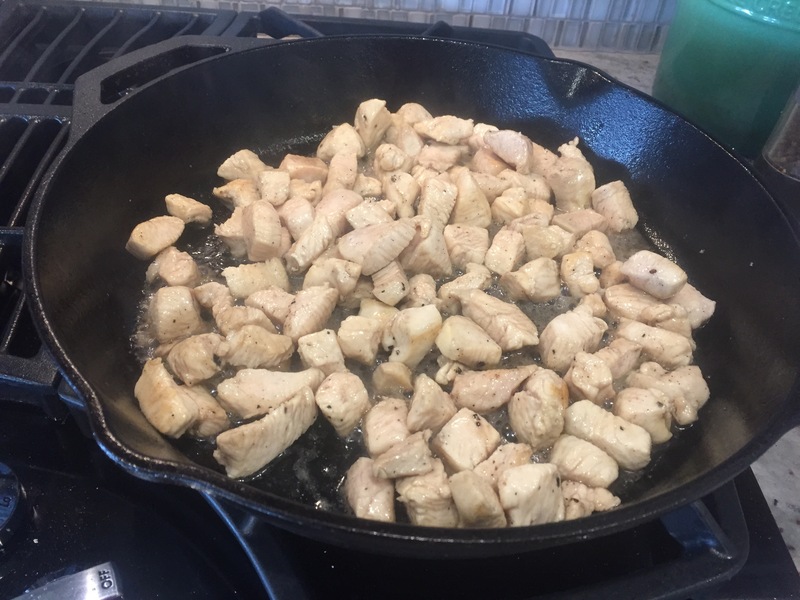 It isn’t necessary to fully cook the chicken at this stage though–the carryover heat as well as the 40+minutes in the oven will finish it off for you. Just get it so the outside isn’t pink any longer. Then, remove the chicken and cook the rest of the filling. 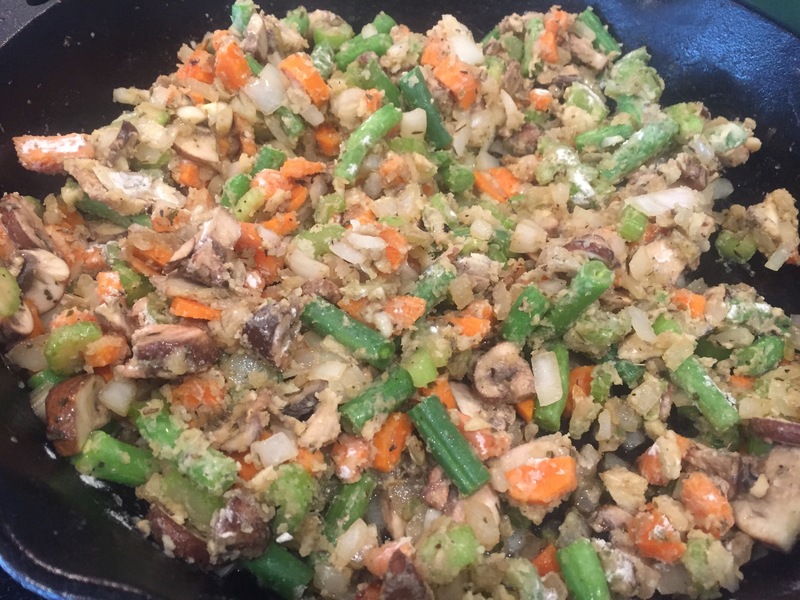 All the veg and spices go in together with a little bit of vegetable oil. Let them cook for a few minutes (again, we aren’t looking for done here, just started). When the onions are translucent, its time to make the gravy. 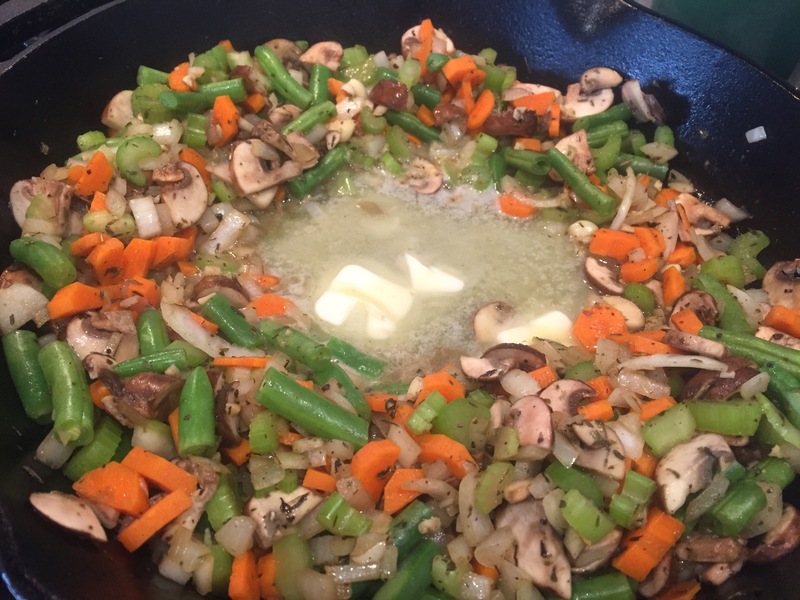 I like to make a well in the middle of the vegetables so I can keep an eye on the butter. Allow it to just melt, then dump in the flour. It will be a pasty mess. Its ok. Just stir it around as best you can without mushing all your vegetables up. Make sure all the flour has been moistened and let it cook for a few minutes to turn it from yucky raw flour taste to a more lovely nutty taste. Then add your milk/stock mixture and stir continuously. It will be very soupy for a while and then, like magic, it will thicken. Its almost ready here. Once it coats the back of the spoon and holds a sharp line when you run your finger across it, its done. Turn off the heat because its time to make a Rough Puff Pastry. 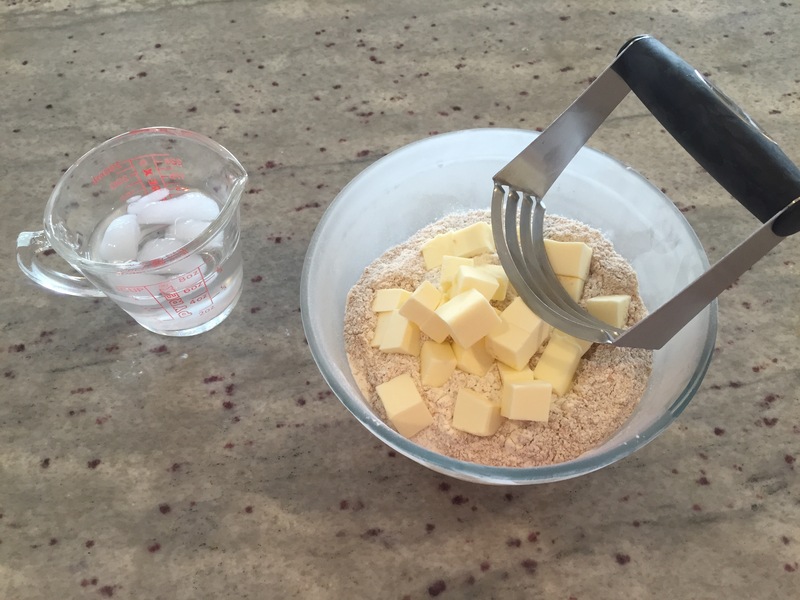 Cube your (very cold) butter and add it to the flour/salt mixture. Try to handle everything as little as possible as we are trying to keep it cold. I put my bowl for this in the freezer for an hour or so while I was working on the filling. 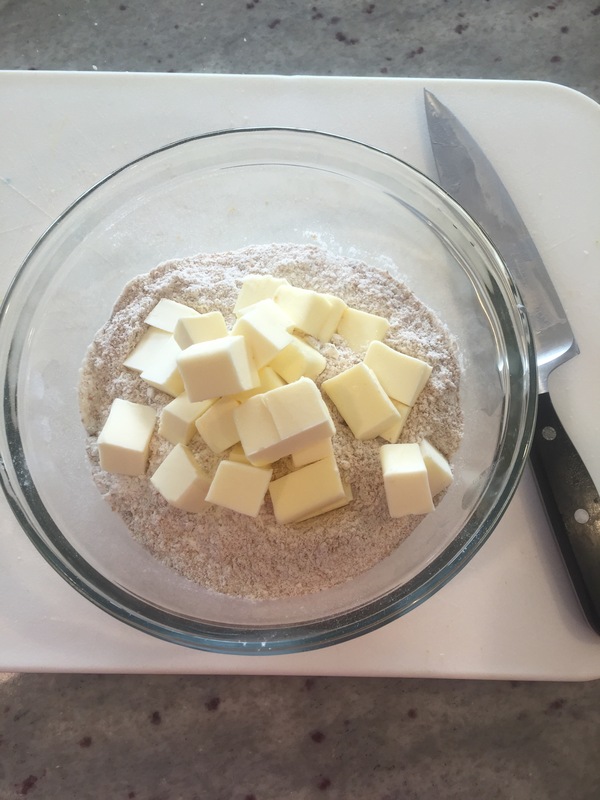 With a pastry cutter (or a bench scraper), chop the butter into the flour until the pieces are almond sized. Then, add the ice water 2 tblsp at a time until the dough just barely comes together. You can do this with a spoon in a cold bowl or on your counter, whichever you prefer. 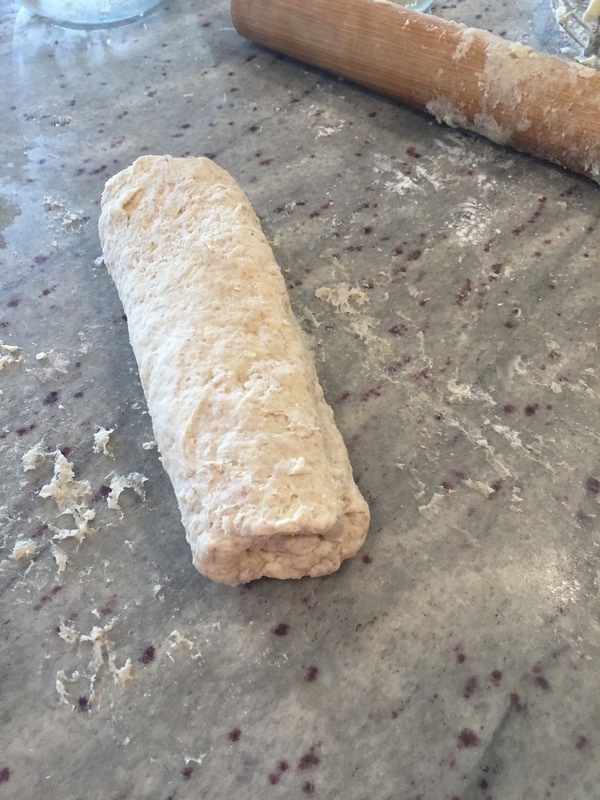 Working with your bench scraper and rolling pin, you want to roll/beat out the dough into a rectangle (about 8×10), then fold it in thirds as you would a letter. Then turn it 90 degrees and repeat 3x. This is what creates all the little layers in your crust. This might get hard as the dough tightens up, just do the best you can. Once youve made 4 or so folds, fold it one more time to be a small rectangle. Wrap it in cling film and allow it to rest in the fridge for 30 minutes. While that is resting, you can decide if you want one large pie or several small individual ones. I opted for a large pie but you’ll need 4 16 oz ramekins for individual sized. Roll out your pastry and use a sharp knife or pizza cutter to cut one large or four small circles about 1 inch larger than your dishes. 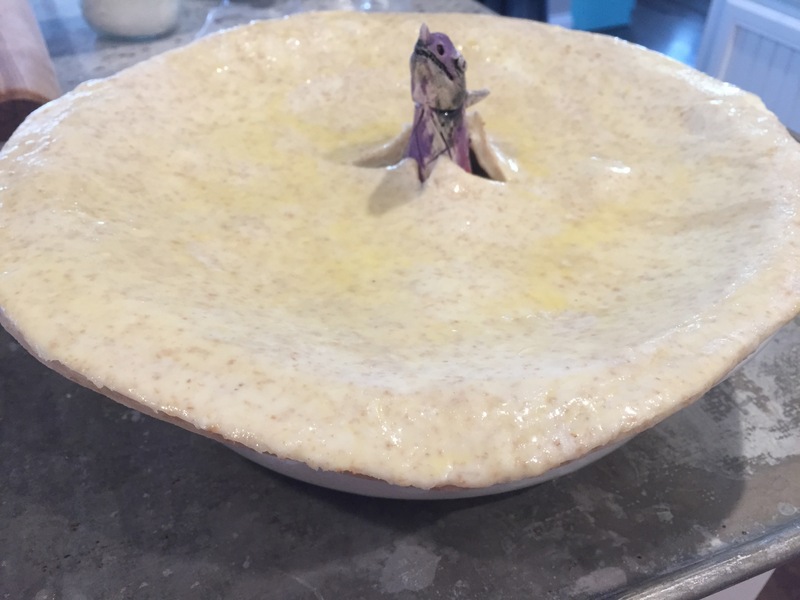 Fill the dishes with the filling and then brush the pastry with the egg wash. put the egg wash side down on the filling and then egg wash the top. If you make one large pie, you’ll have to kind of dish out the filling since this is on the thin side. After opting for a large pie, I wish I had made several smaller ones to avoid the messy filling issue. The taste however? Amazing. 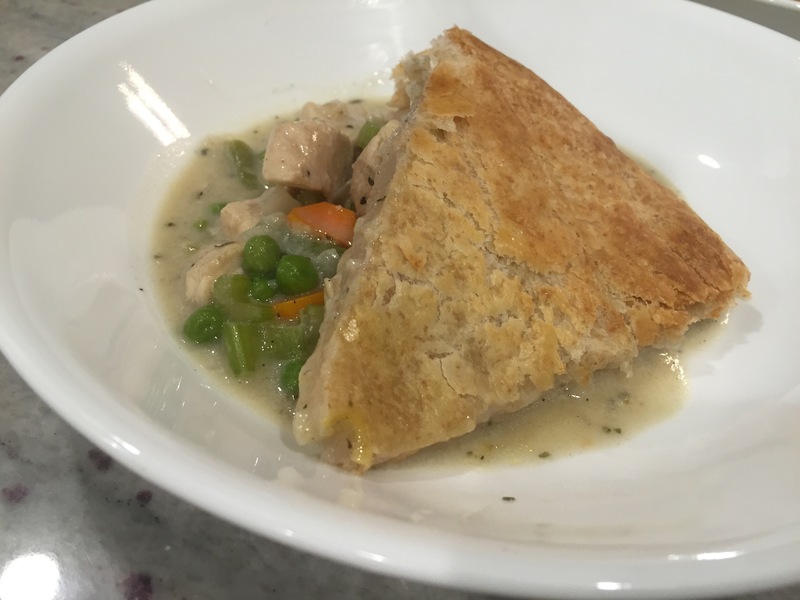 Tender chicken, tasty vegetables, and a super flaky buttery crust on top. 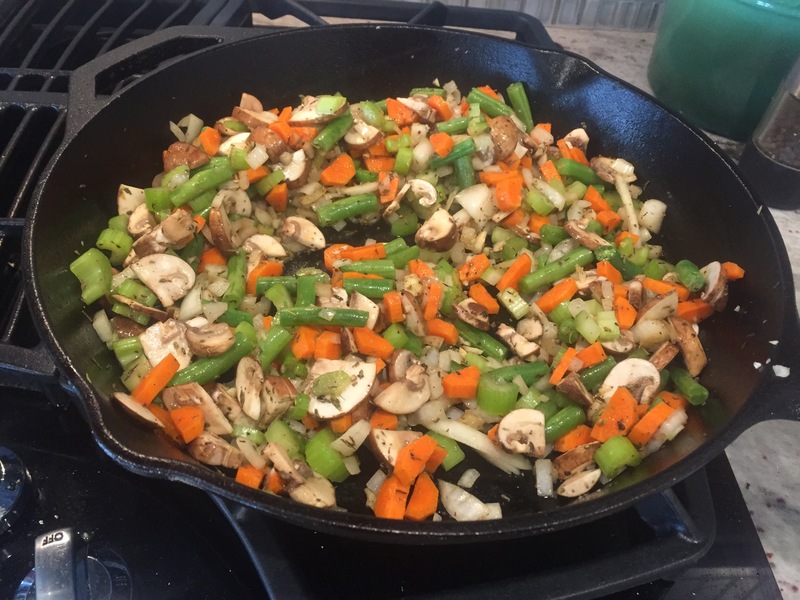 Decrease the heat to medium and heat the remaining tablespoon vegetable oil in the skillet until it shimmers. 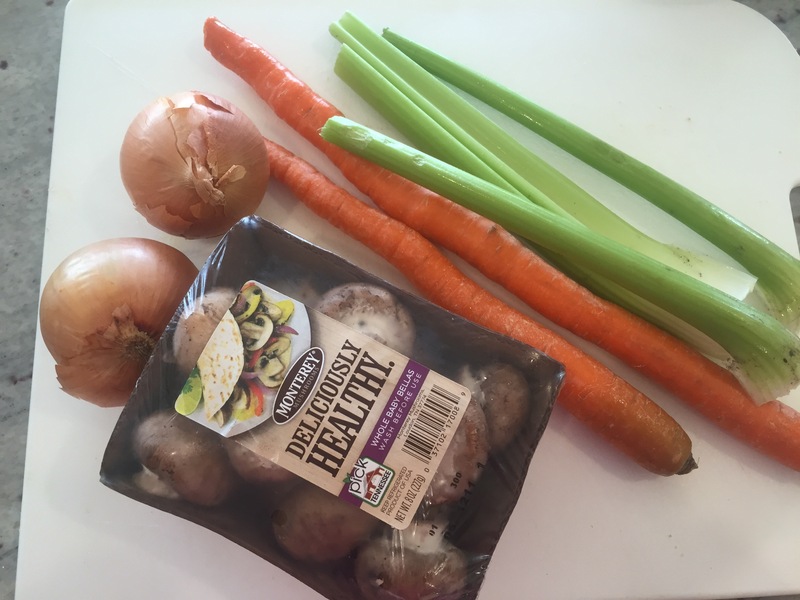 Add the onions, mushrooms, carrots, celery, green beans, garlic, remaining 1 1/2 teaspoons of salt, black pepper, dried thyme, and dried tarragon, and stir to combine. Cook, stirring occasionally, until the onions have softened, about 5 minutes. Make a well in the center and add the butter and melt. Stir in the flour and cook for 1 to 2 minutes. Gradually stir in the chicken broth and milk. Bring to a simmer, stirring continually. Continue stirring until the sauce thickens, about 3 minutes. 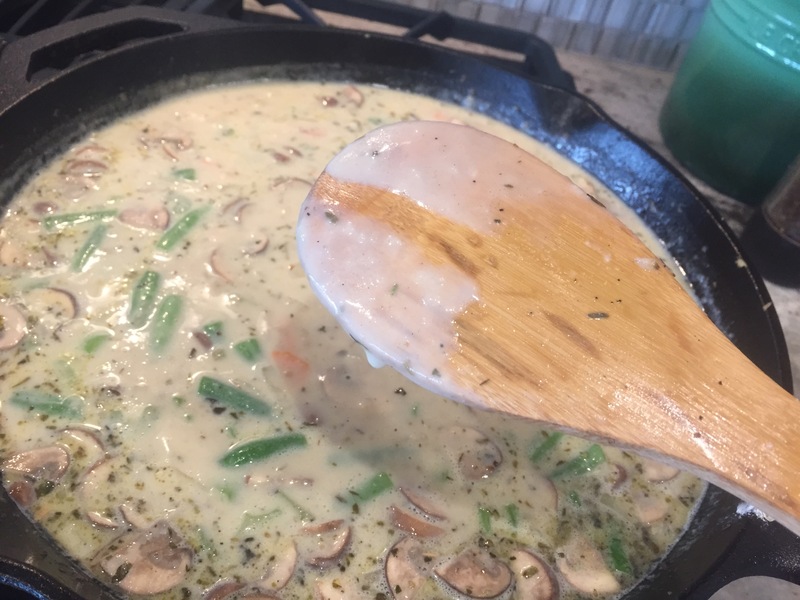 Remove the skillet from the heat and stir in the peas, thyme, tarragon, and reserved chicken. Cover and set aside. To build the pie: Divide the warm filling into 4 (16-ounce) ramekins and place on a half sheet pan lined with parchment paper. 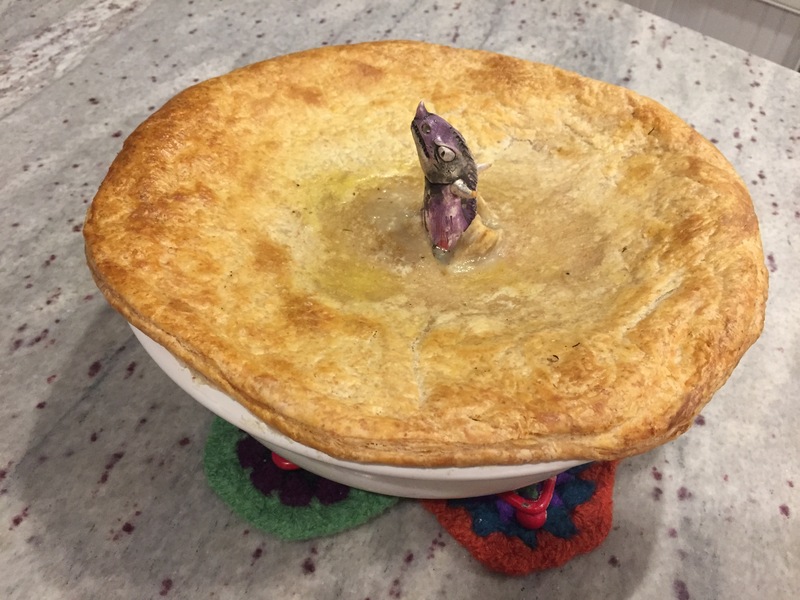 (I made a large single pie and regret not making several smaller ones as the pastry would have been better if it had been smaller and puffed more in the center. Firstly, I love your dragon pie vent. If I made more pies (or heck, even had my own kitchen right now), I’d order one from the lady who makes them. Secondly, it amuses me no end that you posted this recipe on a day when I had chicken pot pie for dinner. While mine wasn’t homemade (it was from Costco), it was still darn tasty!